Legal graffiti on the walls of a private business at 5th and Cecil B. Moore Avenue. It's been 20 years since Christian "TameArtz" Rodriguez first started adorning the wall at Fifth and Cecil B Moore with graffiti. "As the wall evolved, the artist that painted the wall evolved with it," Rodriguez told PhillyVoice. The wall, Rodriguez explained, has not just been a spot for Philly artists — "It's a staple to the graffiti culture worldwide." Sometime in the near future, the wall that wraps around that corner will be coming down. But it's not a goodbye, it's a new beginning. 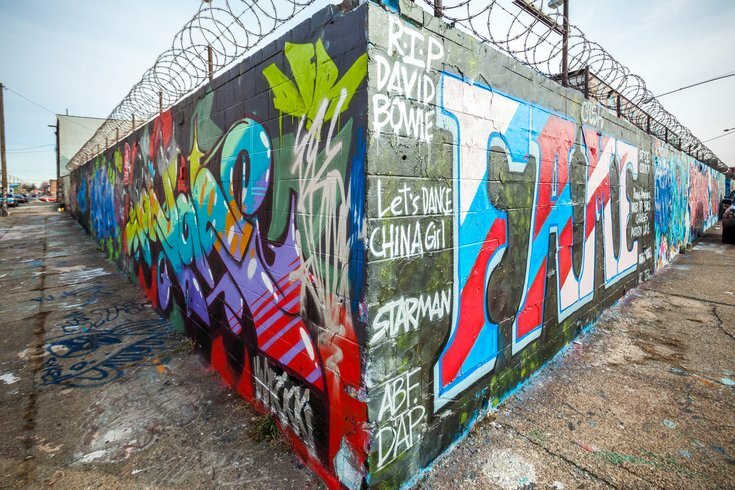 That's according to both Rodriguez and the developer behind a large project planned for 1700-50 Germantown Ave., a property that includes the iconic graffiti location. Stull Investment Company — which owns the property and is bringing a new park and mixed-use buildings to the lot — said a new space will be available to the artists who've decorated the corner with gritty, modern and emotional art. "The walls aren't what made them so great. It's the people of the community around them," Chadwick Smith, CEO of Stull Investments, said Friday. The project is described as "an appealing mixture of uses including office, retail, co-work, residential, hospitality, community activity, urban agriculture, and more." On the northern corner of the plot, a park with a dog park, grills, benches, raised beds for planting and other amenities will replace an open lot. That part will be free and accessible to the surrounding community, Smith said. Within the boundaries of where the wall is located, there will be two apartment buildings connected by a bridge with 130 total units, as well as 50,000 square feet of retail space beneath them. A seven-story office building also is going up. In between those three separate buildings will be a street where the artists who've tagged the walls over the years will be able to continue their work. Smith noted that since his company purchased the lot in March 2017, they've allowed the artists to continue using the walls for graffiti. He added that he's communicated with Rodriguez and the other artists responsible for the changing landscape of the walls, and that the talks have been positive, as he plans on having them fill the new street canvas once the project is finished. Rodriguez has worked with Smith before, and said Smith informed him about what was going to happen to the wall in a meeting for an event a few months ago. He "100 percent" understands Smith's decision from a business perspective. But more importantly, he and his crew of fellow artists are grateful Smith included them and is allowing them to be apart of the changes. "To have someone like Chadwick be supportive and have people come here to paint, I think that's awesome," Rodriguez said. "You can't buy that kind of support that he has. I hope the graffiti artists are aware of that." Rodriguez explained that graffiti culture, like hip hop culture, has gradually become more accepted in the mainstream. Works that were once considered vandalism are now used in advertisements. The second annual All Love Block Party, which will feature performances from prominent Philly artists like Asher Roth and Chynna, is being held on the same block as the development all day Saturday. The blog WooderIce describes the event as partly a "Goodbye to the Legendary 5th & Cecil B. Moore Graffiti Wall." Smith did not give a set date for the demolition of the wall, but said the first phase of the project is expected to be completed sometime in the spring or summer of 2020.